Atlantic Microwave has claimed a world’s first, simultaneously, in two ‘of the moment’ technologies. The company has announced the maiden flight of their DSS Satellite Simulator product on board an eight rotor drone. This a first ever airborne Satellite Simulator and is the first time in history, according to the company, that an unmanned aerial vehicle has been deployed in such a task. 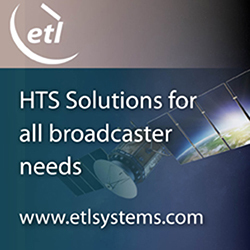 Off-air testing of ground and vehicle based satellite communications systems has developed into a major industry need with the current explosion of SATCOM applications in multiple industries. These systems cannot just switch on and hope for the best. The potential to upset fellow satellite users is risky and expensive and Atlantic’s Satellite Simulator and Loop Test Translators have been saving the day for SATCOM operators worldwide during recent years. Drones, similarly, have been taking the world by storm with uplifting applications both professional and amateur in use. By combining these two major advances, Atlantic Microwave has provided a service to customers that is currently unrivaled — while the first flight, which occurred in Denmark, used frequencies in the Ku-band for ‘proof of concept,’ Atlantic is also offering similar payloads in Ka-band, which delivers greater bandwidth, X-band for the military, as well as future Q- and V-band operations. Atlantic Microwave, based in Braintree, U.K. has established itself as a global leader in satellite simulation with their antenna and cabled-in based products, which are supplied to major SATCOM operators, integrators and manufacturers on all continents.